Sorry that I've neglected my blogging duties this past week. I had so many Christmas things I wanted to share with you, but my DH was was rushed to the hospital on Tuesday. It was pretty scary stuff, but things are under control now and fortunately he was able to come home yesterday just in time to celebrate Christmas. Who could ask for a better gift? So from our house to yours, We Wish You The Merriest Christmas Ever and I'll be back when the new year begins! Thank God he is home. I wish you all a healthy and Merry Christmas! So happy to hear all is doing well. Both of you have a wonderful holiday. Merry Christmas Jeanne!!! I'm glad your husband is doing better and is home for the holiday. Have a great one! I am so glad to hear that your husband is feeling better. No gift will be as good as that. Have a very Merry Christmas! Blessings and magical memories this Christmas. joyeux noel jeanne. so glad that your hubby is home and doing well. a blessed gift indeed! Health and happiness in the New Year! 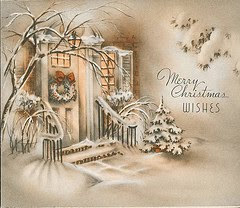 Jeanne, Wishing your husband good health and both of you a Merry Christmas. Oh my so glad DH is back homeit's really what counts Merry Christmas from Golden Oasis! Was thinking of you and just thought I would stop by to wish you a MERRY CHRISTMAS! sorry to read about the scare but hope hubby is feeling much better everyday! warmest wishes for good health and happiness! I hope everything is ok with George, and that you all had a wonderful Christmas! Much love to you sweet friend!